Many people telephone me for help with a social phobia or because they have problems making friends and feel lonely. You might not be combatant and fall out with people, but you feel shy and unsure of yourself around others. This can also be a problem for some people at work. This social anxiety or social phobia can sometimes carry on for years with you isolating yourself or not advancing yourself in life. • Are you afraid to approach people you do not know? • Do you avoid social settings? • Is there a time when someone has described you as shy? • Have you missed out on being friends with particular people because you were afraid they would not think you good enough? • Has promotion or business passed you by because you are not making the contacts you need? • Are you feeling lonely and isolated a lot of the time? 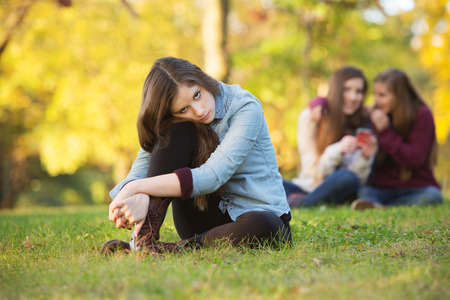 While it is true you could have developed a social phobia or social anxiety because of a traumatic incident in your past that damaged your confidence, most people become socially isolated because they do not possess the skills to communicate well with others. Having thousands of friends on Facebook does not count because they are virtual and not face-to-face encounters. As a human you need those one-to-one or one-to-many social interactions to help you feel valid and connected in life and to promote your mental and emotional wellbeing. None of us can live well in isolation, as we become intolerant and dismissive of others. Humans are pack animals that do well when they hang out with each other. We also have a physical need for connection too. Nursing studies have showed that people recovering from surgery in hospital recover faster when they get a lot of visitors who they chat and laugh with, even if it hurts. Longevity studies show that people who experience love and friendship stay healthier as they age and tend to live longer. So, having love in your life reduces neurosis and dementia, promotes better organ function, sleep, and better control over eating, to name but a few. • Start an introduction with small talk. No one wants a serious conversation during an introduction because you are just getting to know each other. It’s like an introductory courting dance. Ask people what their interest is in coming to an event, or chat about the weather. • Keep the introductory conversation light and general so you can find something in common to help you connect with each other. •Learn about body language so you know how to be an open communicator and ensure that you are not accidently closing down a communication by scowling and crossing your arms. • Keep the conversation positive so you are encouraging the production of oxytocin which is the hormone that helps people bond. • Be mindful of the other person’s customs so you know how close to stand and what subjects to engage with or which ones to avoid. As you get good at initial meetings, begin to suggest you stay in touch with the person – if you feel rapport has been built and the other person seems interested. Don’t be offended if they are not interested, as you will have some things in common with some people but never with all of them. Exchange details, contact them later and suggest something to do together. One of the best things you can do is get help from a professional who helps people be more socially skilled and confident. Learning from a professional cuts down the time it takes to resolve your problems and accelerates the learning of your new set of socially adept skills. If you need help in overcoming your social anxiety or social phobia, call my clinic on 02 8021 6429 to book an appointment.